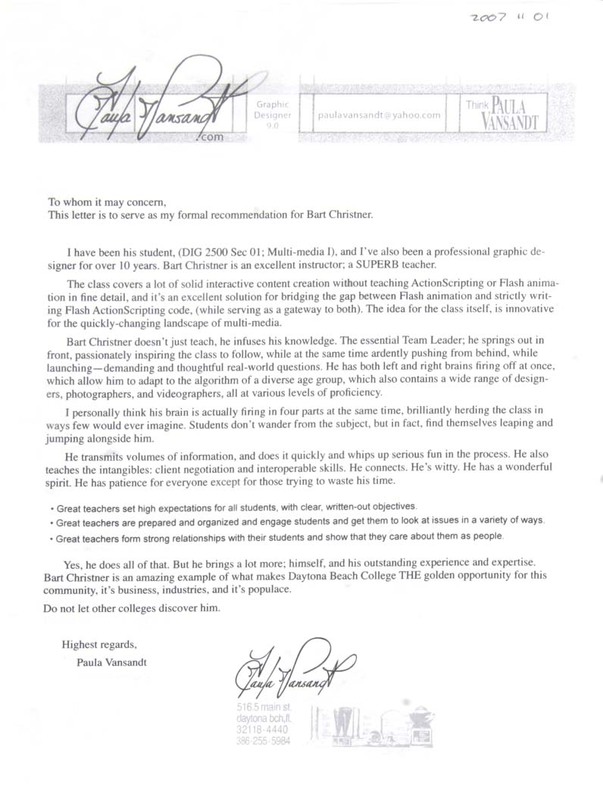 This letter is to serve as my formal recommendation for Bart Christner. I have been his student, (DIG 2500 Sec 01; Multi-media I), and I’ve also been a professional graphic designer for over 10 years. Bart Christner is an excellent instructor; a SUPERB teacher. The class covers a lot of solid interactive content creation without teaching ActionScripting or Flash animation in fine detail, and it’s an excellent solution for bridging the gap between Flash animation and strictly writing Flash ActionScripting code, (while serving as a gateway to both). The idea for the class itself, is innovative for the quickly-changing landscape of multi-media. Bart Christner doesn’t just teach, he infuses his knowledge. The essential Team Leader; he springs out in front, passionately inspiring the class to follow, while at the same time ardently pushing from behind, while launching—demanding and thoughtful real-world questions. He has both left and right brains firing off at once, which allow him to adapt to the algorithm of a diverse age group, which also contains a wide range of designers, photographers, and videographers, all at various levels of proficiency. I personally think his brain is actually firing in four parts at the same time, brilliantly herding the class in ways few would ever imagine. Students don’t wander from the subject, but in fact, find themselves leaping and jumping alongside him. He transmits volumes of information, and does it quickly and whips up serious fun in the process. He also teaches the intangibles: client negotiation and interoperable skills. He connects. He’s witty. He has a wonderful spirit. He has patience for everyone except for those trying to waste his time. Great teachers set high expectations for all students, with clear, written-out objectives. Great teachers are prepared and organized and engage students and get them to look at issues in a variety of ways. Great teachers form strong relationships with their students and show that they care about them as people. Yes, he does all of that. But he brings a lot more; himself, and his outstanding experience and expertise. Bart Christner is an amazing example of what makes Daytona Beach College THE golden opportunity for this community, it’s business, industries, and it’s populace. Do not let other colleges discover him.